Ready for Thanksgiving? Don’t worry, I’m not either. Not even close. Since time is short, this year’s decorating ideas have to be fast. 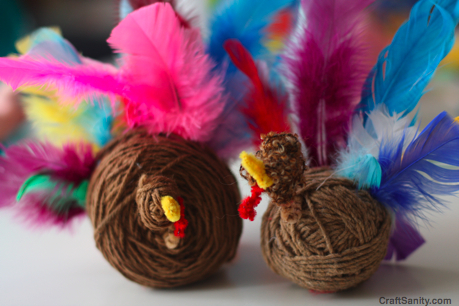 So we decided to use balls of yarn, pipe cleaner and colored feathers to whip up some cute turkeys on the fly. To make your own, roll a small ball for the head and one about four times that size for the body. Use pipe cleaner to connect the head to the body and create facial features. This is where I turn the project over to my daughters who love to poke in the colored feathers. 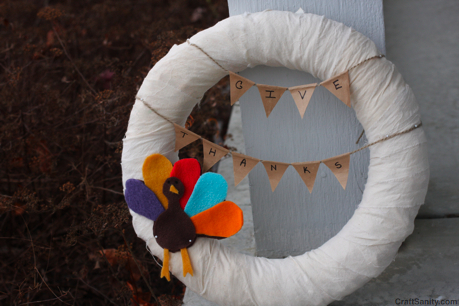 I also made a wreath by wrapping floral foam with a torn fabric. I made the little banner by cutting triangles on the fold of a paper bag. The turkey is made of felt and polar fleece. I glued it together with a glue stick and pinned it in place because I didn’t have time to sew it. This pumpkin in the easiest part of our Thanksgiving decor. 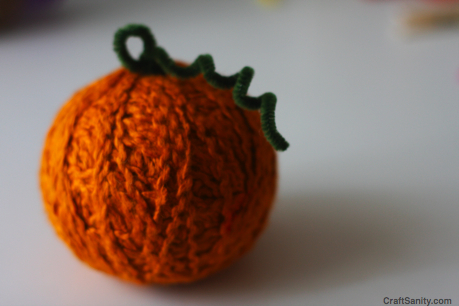 Just grab a ball of orange yarn, fashion a stem out of a green pipe cleaner, and curl another pipe cleaner around a pencil to create the vine. Poke both pieces into the yarn ball and you’re set. Done, done and done. And even if I had more time, I will probably never top the turkey noisemakers that I made a couple years back. Check those out if you missed them. They make for a noisy holiday fun. Here’s the video of today’s TV segment. Watch it and see the totally insane not-so-last-minute craft I had planned for the segment. Thankfully, I scrapped Plan A and moved on. Okay, time to pick up the magazine proof. I’ll be back soon with a full report including preview photos and ordering information. Hey Nick I do notice weenevhr I see you photos that, at least your fam, seem to live in new development(s). things look very recent and new. crazy that they actually destroyed parks in your old neighborhood.. you figure a park is something that is garunteed to be there for the forseeable future. I would like to thank you for the efforts you have put in writing this web site. I am hoping the same high-grade website post from you in the upcoming also. Actually your creative writing skills has encouraged me to get my own blog now. Really the blogging is spreading its wings rapidly. Your write up is a great example of it.